After a comically misinformed start, reporters in the established media have actually improved their Bitcoin coverage considerably, at least from a factual perspective. I am noticing much less misunderstanding regarding the functionality of the protocol itself (not withstanding the interview posted yesterday with Jeff Berwick trying to allay the interviewers insistent fears about "who manages this thing!?") In this post, we'll look beyond the media coverage and into the future. Remember, Bitcoin is just the engine. In the coming years, clever entrepreneurs and dedicated engineers will bring us the cars, the roads, and the infrastructure to unlock its true potential. Many of the following products and services are already under development, but none have been truly commercialized. For the enterprising individuals with the grit to tackle these jobs: first market movers will find the rewards substantial. This one has been in the works for a while, at least in theory. When the successful implementation of revolving credit began over 50 years ago, people had to rethink their conception of money. "Think of it as cash," was the marketing technique used to encourage individuals to trust credit cards. Now that we've come this far, a debit card that could transact Bitcoins securely would provide familiarity and convenience to individuals who use the virtual currency. 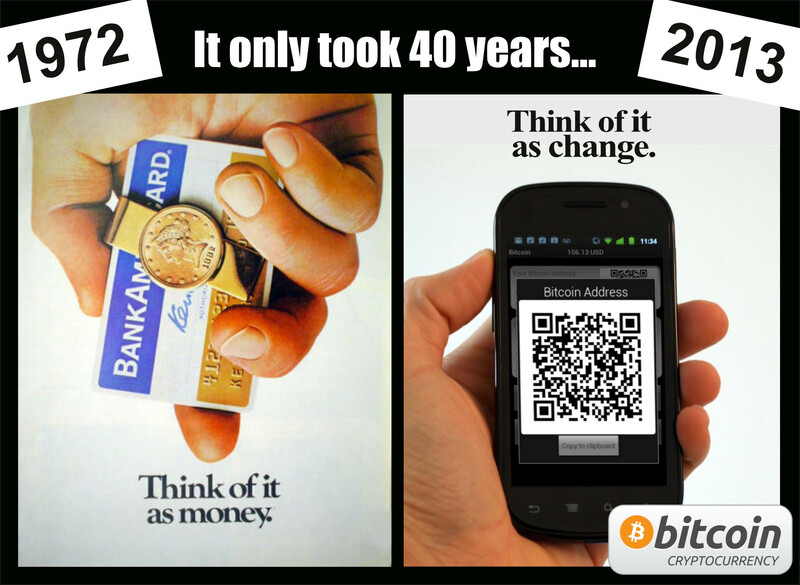 As all Bitcoins are essentially digital, we must experiment with ways to interact with them in the physical world. The "hardware wallet" is a concept that would provide individuals with a tangible item which could easily send and receive Bitcoins at a point of sale. Whether this wallet is small, large, hard, soft, techie, or traditional has yet to be seen. Maybe it will have the embodiment of a ring or a watch. Decades from now, it could even be an implantable device with biometric access keys. Whatever its manifestation, there is a growing demand for a physical Bitcoin wallet. Despite the functionality of Bitcoin which allows you to be your own bank, one which attracts many Bitcoin users with the time and tech savvy to ensure proper safety and backup precautions, there will be a place in the future for trusted third party management of Bitcoin. Bitcoin simply allows us the freedom to choose the level of trust that we wish to impart. Many will opt for traditional banking arrangements, among which will be a spectrum of risk profiles, from full reserve banking to money market accounts, CDs, and long term investments. These consumers will value at least some forms of insurance protection to offset the losses that would be incurred if their bank were robbed. Bitcoin banks and insurance companies could in theory work under familiar frameworks, but to be truly successful, they will need to invent a new class of highly secure, customized Bitcoin protection solutions. Volatility is one of the most commonly cited concerns by current and potential Bitcoin users, and with good reason. Price fluctuations create transactional difficulties between merchants and customers. Originally, currency options markets were invented to diversify risk when making international purchases. A deal or ongoing business relationship may include contracts to purchase at certain prices. Properly created options structures allow businesspeople to limit the downsides of future currency vicissitudes. A deep Bitcoin options market would allow for more reliable long term business interactions, in addition to potentially unforeseen benefits such as overall reduced volatility. This cannot be understated: The inventor of the reddit Bitcoin tipping bot is a genius. I don't know his full name, nor to I have his permission to share it, but you can find him on reddit. For the uninitiated, the reddit tipping bot allows individuals to instantly send Bitcoins to other reddit members by typing a simple command in a comment. For instance, if I like what somebody wrote, I can show my appreciation by typing: "+bitcointip 1 BTC" and it will be credited to them almost instantly. The possibilities are enormous, and the first successful inventor of the web-wide Bitcoin tipping bot will win the internet. While I'm not particularly fond of lotteries in general, at least not the way they prey upon people who are financially illiterate, they are a very successful phenomenon, and if you are a fan of philanthropy, you can justify their existence by the large contributions that they make to certain public causes. However, if your eyes bulge when you see a Power Ball or Mega Millions grand prize above $500 million, then to quote Bachman Turner Overdrive: "You ain't seen nothing yet." Taking the lottery model global, transcending legal and political boundaries, would enable the creation of the mother of all sweepstakes. Companies such as lendingclub.com and prosper.com have tried to implement P2P lending for a few years, with both some success and difficulty. The concept of connecting individual borrowers with individual lenders is not new, but the perfect recipe has never quite been cracked. In short, lenders are not qualified to assess borrowers as well as banks are (in theory), and borrowers need to be held accountable to limit cases of fraud. Much of the issues at hand, however, can be attributed to a clumsy financial framework of bank wires and credit cards. If somebody is motivated to discover a way to make P2P lending more successful, then the Bitcoin protocol can carry them a fair chunk of the way towards that goal. Today, when making large financial transactions, such as buying a house or signing a business to business purchasing contract, multiple parties must be involved to ensure proper execution and fidelity on behalf of both parties. An exciting functionality of the Bitcoin protocol, which remains dormant today, has the potential to replace mediators and be the arbiter of financial disputes, using verifiable data (i.e. Was $15 million sent from account A to account B on June 26th?) to resolve transactions. The inventor of a trusted Bitcoin-based arbitration solution would be able to access a deep and international market. So what do you think? Did I leave anything out? What Bitcoin inventions are you looking forward to?